Two storms are set to hit drought-stricken Southern California this week and drench the parched region with rain and maybe even snow. A surge of high pressure will make its way through the state on Tuesday, with a strong storm system collapsing by the middle of the week and bringing big weather changes along with it. With a few days left until the wet storm arrives, you can track all the weather changes on the FREE NBC4 Weather app. It's complete with extended and hourly forecasts, extreme weather alerts, a radar map and videos from your favorite NBC4 weathercasters. The first storm system is expected to bring showers Wednesday night into Thursday morning. The much stronger second storm will roll into Southern California with heavy rainfall Friday night into Saturday morning. Snow, cooler temperatures and gusty winds will accompany the much-needed moisture. Coastal areas and valleys are expected to see 1 to 2 inches of rain, and foothills and mountain areas are expected to see 2 to 4 inches. Friday will likely see snow starting at 6,000 feet. Track the storms' progress and get the latest SoCal weather wherever you are, with NBC4's free weather app. Click here to download. 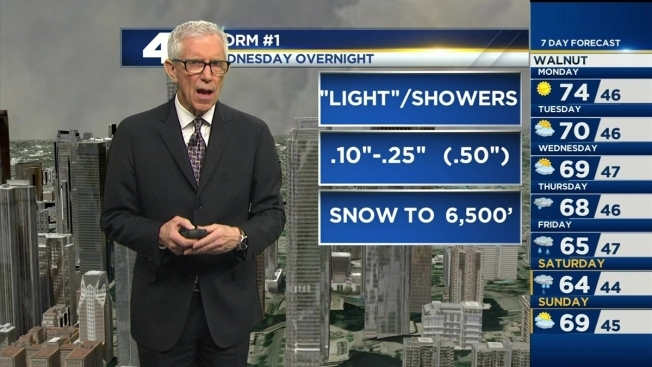 Because it’s been so long since Southern California was last doused, the combination of measurable rain from both storms could bring some difficulties. Burn areas have potential for mudslides and streets could be especially slick because of months of accumulated oil that has not been washed away.